Recently a MM user asked on the Mindjet forum whether it was possible to make a map with these “hand-drawn” many-to-one floating topics in which such a way that they could be made to appear and disappear in a similar manner to the way in which topic levels in a conventional MM map can be collapsed or expanded without manually removing and/or replacing them. The general consensus seemed to be that this would be very difficult to do, but I think I’ve come up with an approach that makes this possible. First, consider the problem. If we have a map something like the one above, the user wanted to be able to highlight a specific many-to-one floating topic and its relationships with the subtopics in the main map tree by temporarily removing the other floating topic and its relationships, to look like this: – or alternatively to do the same with the other floating topic, like this: – or remove both, and then quickly return to the fully expanded state. The trick I came up with is to use a completely blank floating topic with no text, lines or fill colouring which renders it invisible. Then attach a sub-topic to this floating topic as the “real” many-to-one target topic. This can be formatted as you wish but should have no topic lines (you might need lines for sub-topics of this topic, but I’ll come back to that later). Then you attach the relationship lines to the relevant sub-topics (or main topics) on the main tree. Sub-topics with lines: The orange topic has three child sub-topics connected with conventional lines. I’ve reinstated the line for the orange topic to make the connection more obvious but you don’t have to use it; without the three subtopics would still have lines connecting them to the +/- button but no line to their parent topic. The +/- button on the right means that this group can be made to appear and disappear independently of the orange topic, but the whole group disappears when the orange topic’s button is clicked. Sub-topics with boundary fill: The blue group works substantially the same way, but I’ve put a boundary around the group with an appropriate fill colour and tried to make the topic lines a matching colour to this. Otherwise this group is technically the same as the first group. 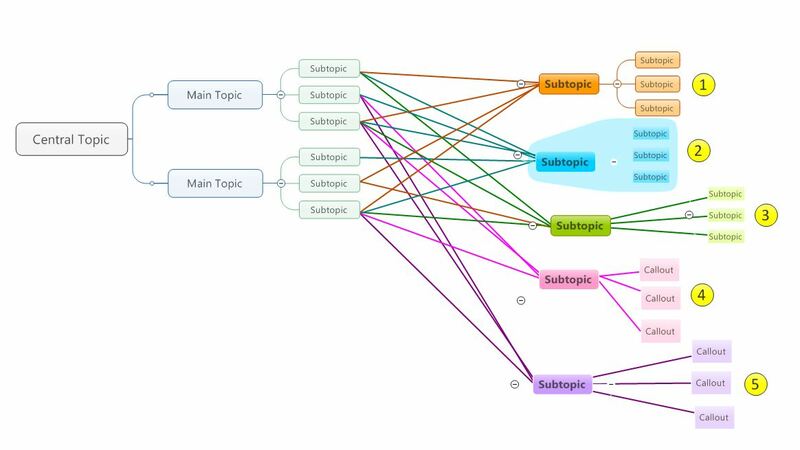 Invisible floating topic with relationship lines to subtopics: With the green topic I’ve repeated the same trick I used with the orange and blue topics in the earlier maps. There is an invisible floating topic to which the three pale green sub-topics are attached. These subtopics have no lines but are linked instead to their parent by relationship lines. This means there is more flexibility in where you place this sub-group and they can still be made to appear and disappear as a group, but the downside is that to remove the green topic and this group completely from view you have to click both the +/- icons. Callouts with relationship lines: With the pink subtopic I’ve added callouts instead of sub-topics. These callouts have been formatted to have a fill colour but no lines; instead they have been given relationship lines. This gives you more flexibility as callouts can be moved around more easily, though bear in mind they can do strange things to the placement of their parent topic. The disadvantage however is that the callout group cannot be collapsed independently of their parent topic, though unlike floating topics they will disappear when the parent topic is made to disappear. Invisible floating topic with callouts and relationship lines: Finally with the purple subtopic I have combined these techniques. Attached to it is an invisible subtopic to which the callouts are then attached. The callouts are formatted without lines but have relationship lines back to the parent purple topic (not the invisible subtopic). This means you can make this group appear and disappear as if they were conventional subtopics and they will also disappear when the parent purple topic is collapsed, while at the same time they have the greater flexibility in terms of placement that callouts have over sub-topics. All these options may seem like a bit of work but once you decide which is the best approach for your needs you should be able to save the sub-topic group as a map part and just format it as required when you paste it in the map. This entry was posted in Mind Mapping, Viewing, Filtering and Formatting and tagged Mind Mapping, MindManager. Bookmark the permalink.